It is important to provide your customers with as many details of their purchased products as possible. However, admins can not include page-to-page instruction on the product page; then the most convenient solution is to display a brief description associated with various additional documents. Magento 2 Product Attachments extension supports uploading different files right on the item pages such as user manual, installation guide, product video, sample image, and so on for customers to download. 1.1 Does the Default Support Magento 2 Product Attachments Feature? 1.3 How Can Magento 2 Product Attachments Extension Benefit you? 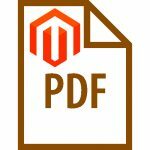 Magento 2 Product Attachments extension is available for various file formats including pdf, ppt, txt, mp3, zip, jpg, etc. 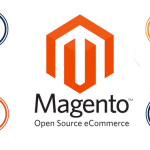 Thus, this Magento 2 extension allows freely adding numerous documents to one product page, as well as uploading an attachment to multiple pages, so that customers easily find needed information before placing an order. Moreover, admins can decide the size and show the number of product attachments downloaded. The display position of those files is also set up to make it convenient for customers to access and download. Have a look at Magento 2 Size Chart extension which enables to assign a sizing guide to items with lots of size options. Does the Default Support Magento 2 Product Attachments Feature? For some certain products, a brief description is not enough, and customers feel hesitate to make an ordering decision. In that case, step-by-step user guide, product images, or videos,… are in need to bring them more information and promote purchasing process. 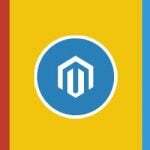 The online sellers are limited to upload additional files in Magento 2 default as it does not support product attachments at all. BSSCommerce frees shop owners from that concern with Magento 2 Product Attachments extension – a must-have module including wonderful features. 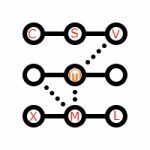 How Can Magento 2 Product Attachments Extension Benefit you? 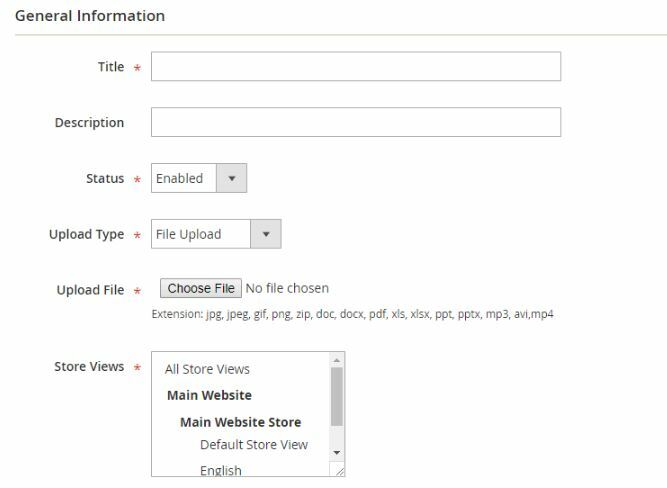 Allowing admins to upload as many types of files as needed, Magento 2 Product Attachments extension enriches the product page with additional information. On Magento 2 Product Attachment Grids Page of the backend, admin can easily manage uploaded files and directly edit in that grids as needed. Multiple attached files on the product page offer professional supports for customers and increase conversion rate by convincing buyers that they are purchasing the right items. Magento 2 Product Attachments extension makes it simple for admins to associate the product page with additional documents within some steps in the backend. 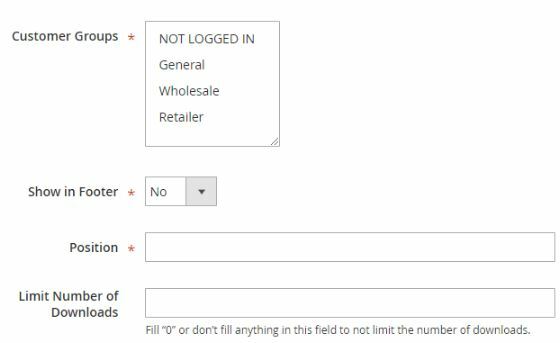 To enable Product Attachments for Magento 2 extension on sites, please follow Store ⇒ Configuration ⇒ BSSCommerce ⇒ Product Attachments, then select “Yes” at the first field. In General Config, admin can choose to display product attachments on the product information or a separate block. If Magento 2 product attachments are selected to show on the product detail tab, then admin can insert the title for that tab. Similarly, the block title can also be edited to catch the customers’ eyes. 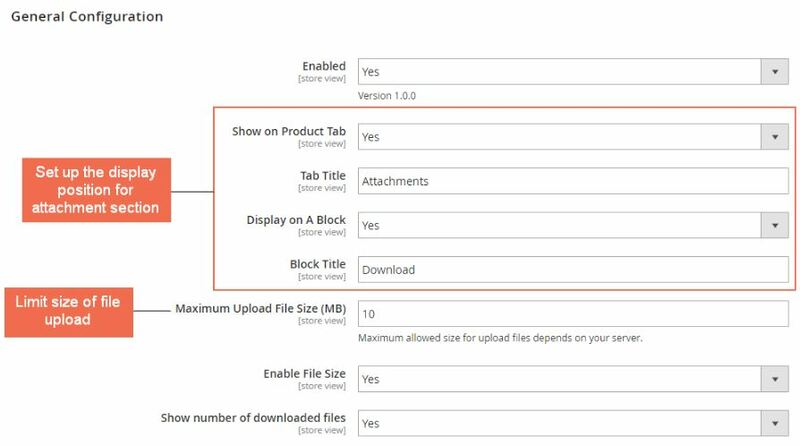 Also, Magento 2 Product Attachments extension supports setting the maximum size of uploaded files based on your servers, as well as showing or hiding the number of documents downloaded in the frontend. After setting general configurations, it is time to upload files as wanted in “Product Attachments Management” of the Catalog tab (Product). There is a product attachment grid for admins to manage all added document and create a new one. On clicking “Create New Attachment”, you are redirected to attachments information tab. Here you see a number of fields consisting of titles, description, status, upload type, store view, customer group, show in the footer, position, and limit number of downloads. Just fill in those fields to specific attached files for customers to download. If you want to update any included files, then click “edit” to go to “General information” and apply changes as wished. 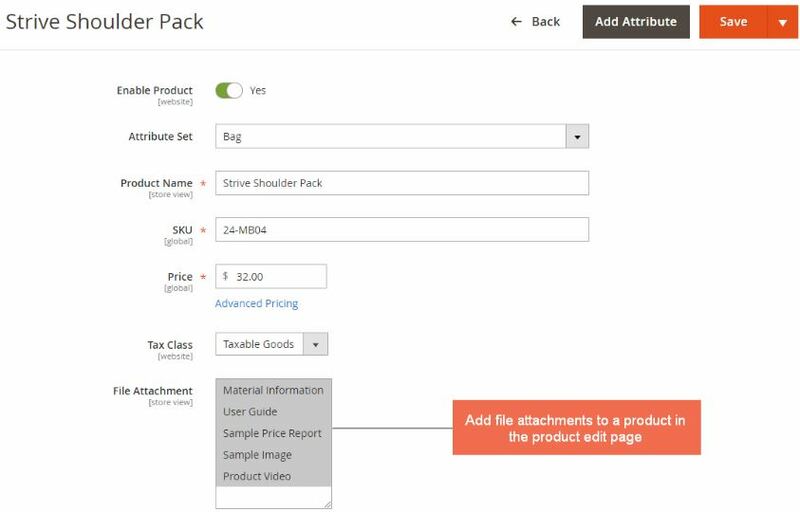 Another wonderful feature of Magento 2 Product Attachments is to upload various files to a specific item, as well as associate one document attachment to multiple products. 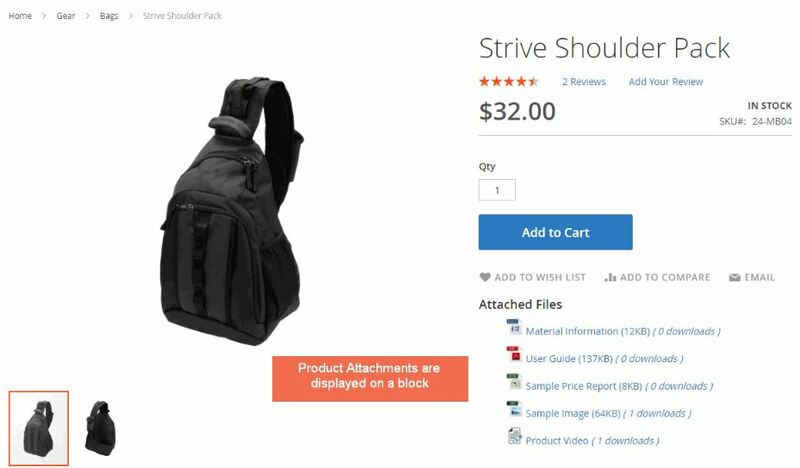 To assign one additional document such as user guide to Strive Shoulder Pack and Joust Duffle Bag at one time, please go to “Assign to Products” tab in Attachment Information, select products, and save the attachment. 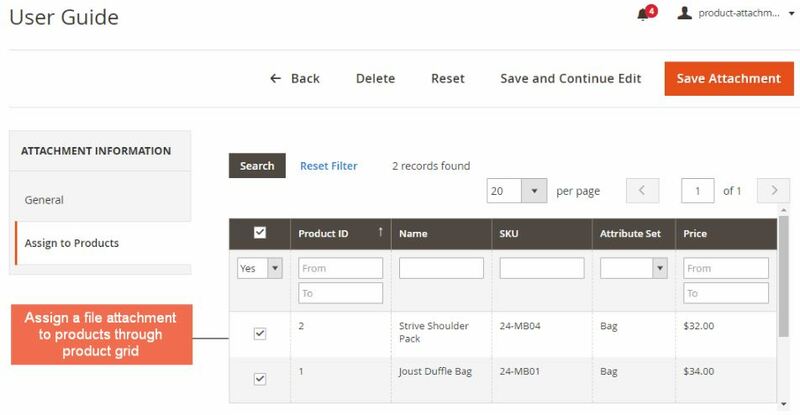 If you want to enrich one product page with multiple additional attachments, just come back the product grid in Catalog Tab and press “edit” to assign a list of files in “File Attachment”. After several configs in Magento 2 Product Attachments backend demo, various associated files are displayed on an independent block, on a product tab, or in the footer of the website. 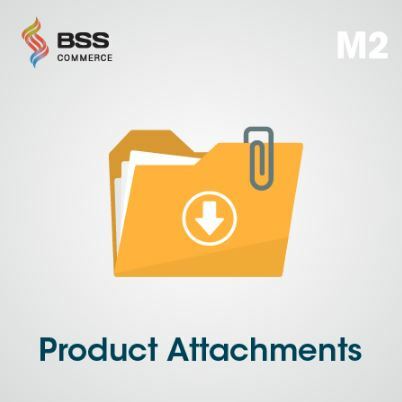 Magento 2 Product Attachment extension by BSSCommerce makes informative documents available to download whether they are docx, pdf, MP3, images, or other formats. Also, admins can easily categorize those files to one or multiple products and restrict downloadable product attachments by store view and customer groups. Download Magento 2 Product Attachment extension now to get free installation, free 1-year support and free update.